Here you will find information on the books, resources, and supplies recommended for use with the Farms Unit Study — Level: Red. The following books are required for the unit study. All of the YouTube videos referenced in this unit study are collected into a single playlist on the Five Senses Literature Lessons YouTube channel. You can find it here. The unit study calls for a few specific toys or supplies. For some activities, small farm animal toys are recommended. There are several different types of animals that would work for this activity that you may have at home. If you do not have anything suitable, the Farm Babies TOOB from Safari Limited is recommended. You can find these at some craft stores and on Amazon. Scissors are required for some activities. Learning to use scissors is an important skill that helps build muscle in the hands which helps with learning to write later. 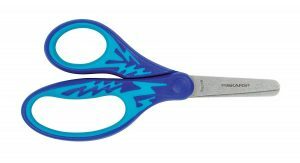 Having good quality, sharp, safety scissors is important in ensuring the activity is enjoyable. If your child is showing signs of left-hand dominance, make a point of getting a pair that is comfortable in both hands or left-hand specific scissors. Fiskars brand is good quality and should last you for years. I couldn’t help it. These are too cute.